The initial Javelin was introduced in 1967 as American Motor Company’s (AMC) answer to the pony car . For 1970 the Javelin received a front end refresh, which makes the 1970 Javelin a one-year only model. As a all new Javelin would be introduced in 1971. The 1970 Javelin was only offered as a two-door hardtop. It was available in base and SST models. The new front end design on the 1970 Javelin featured a wide “twin-venturi” front grille and a longer hood. The rear was also redesigned with full-width taillamps and a single center mounted backup light. Side marker lights that were shared with several other AMC models were added. The rear view mirrors now featured an “aero” design that could be ordered to match the car’s body color. Chrome bumpers were now standard on all Javelins, including the cars with the three “Big Bad” exterior paints options. The front suspension was also new in 1970, which included new ball joints, upper and lower control arms, coil springs, and shock absorbers above the upper control arms, as well as trailing struts on the lower control arms. The engine options were also changed for 1970. 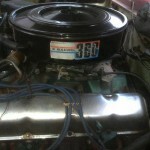 A new 304 cubic inch engine was available on the base Javelin. A new 360 cubic inch V8 was added as an optional engine. These two engines replaced the 290 and 343 engines. 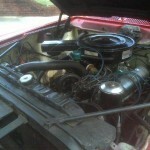 The other optional engine, the 390 cubic inch V8 continued, but it was upgraded to increase horsepower to 325. A new “power blister” hood was available that featured two large openings as part of a functional cold ram-air induction system. This hood was included with the “Go Package” option. The ”Go Package” was available with either the 360 and 390 four-barrel V8 engines. Other features of the “Go Package” included front disc brakes, a dual exhaust system, heavy-duty suspension with anti-sway bar, improved cooling, and wide Goodyear white-lettered performance tires on styled road wheels. The 1970 Javelins also had new safety glass windshields that were lighter than regular windshields. The interior was also revised for 1970. There was a new dashboard, new center console, revised interior door panel trim, and tall “clamshell” bucket seats with integral headrests available in vinyl, corduroy, or optional leather upholstery. A new two-spoke steering wheel was available with a “Rim Blow” horn. 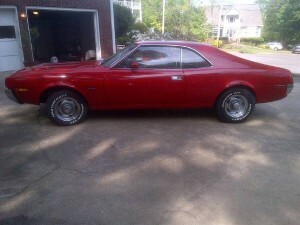 For information on other AMC makes, see our post on the 1968-1970 AMC AMX. 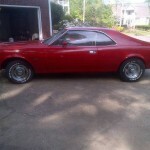 To find your own Classic Car or to sell your Classic Car, see the listings in Classics for Sale. 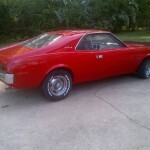 This entry was posted in Javelin and tagged AMX, Camaro, Go Package, mustang, Pony Car. Bookmark the permalink.